Two lovers of the days of Sir Peter Lely are re-exchanging miniatures. The gallant, erect, with face averted, and an air of dignity, coxcombical, but not comical, for he is not intended to be made ridiculous, though exquisitely serious, is removing the lady’s portrait from beneath his laced cravat; the lady, also, with averted face and an air of pettish displeasure, the fan working actively in one hand, has withdrawn its counterpart from its place of tender concealment, and is handing it, ribbon and all, in exchange, with well-assumed indifference. Clever are all the accessories, animate and inanimate, which help to carry on the story. The arch waiting-maid, who makes no great secret of her merriment behind her mistress’ chair; the pictured happy shepherd and shepherdess upon the tapestry of the chamber, emblematic of the lovers’ past, and, who would doubt, also, future paradise of the contentment: even the Japanese screen with its gilt border and hinges; the gold-fish in the glass bowl; the reels of silk for the lady’s embroidery lying in careless disorder upon the table, mingled with the scattered letters of the lover just withdrawn from the open dressing-case. Such details are a matter of course now; but the time was, when a picture of this character, filled with such carefully wrought-out detail, afforded a stimulus to imagination, and was a source of enjoyment in many a middle-class home, not now to be conceived. Artist/Creator: Gilbert Stuart Newton was born at Halifax, Nova Scotia, in 1795. He commenced his studies with Gilbert Stuart, his maternal uncle, at Boston. He made a tour in Italy in 1817 and then visited Paris. In the course of the same year, he went to England and entered The Royal Academy as a student. At first, he adopted Watteau as his model and produced several small pictures in the style of the master. His first works which attracted notice was ‘The Forsaken,’ exhibited at the British Institution in 1821, and ‘ The Lovers’ Quarrel,’ engraved for the ‘Literary Souvenir’ of 1826. Due to the extremely fragile nature of the pages in the 1826 Literary Souvenir in CU’s Special Collections Library, a request was made to not video pages being turned. This video created through an online source provides page turning of one of the main stories “The Lover’s Quarrel” by an anonymous author. 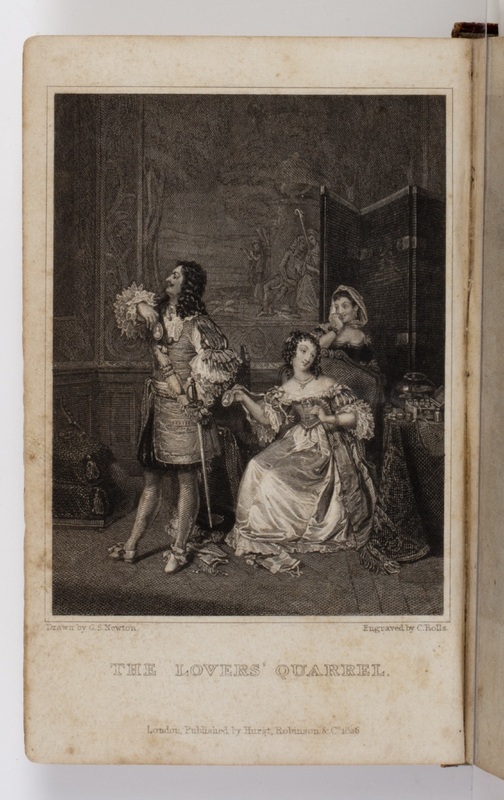 This story was selected as the plate (illustration) is reflective of the nature of the book and was given prominence in the front several pages of the book.